There was no better way to celebrate Phil Rizzuto’s birthday than in the company of San Diego’s finest news crew at CBS Channel 8 and renowned sports artist Christopher Paluso. 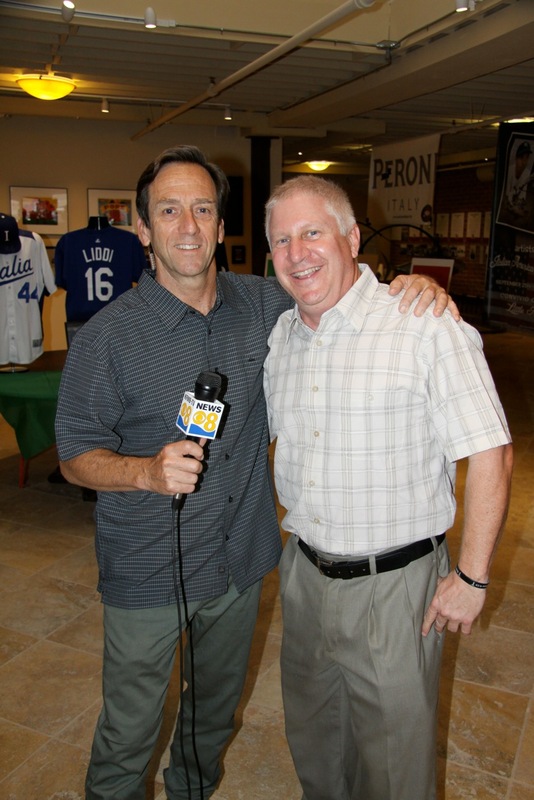 On September 25th, CBS News Anchor Carlo Cecchetto hosted the grand opening evening celebration of the new exhibition Artists’ Tribute to Italian Americans in Baseball after news reporter Shawn Styles enticed viewers to join him for local favorite Tarantino Sausages and Peroni beer during two live remote broadcasts from the Convivio Center in San Diego’s Little Italy earlier in the day. 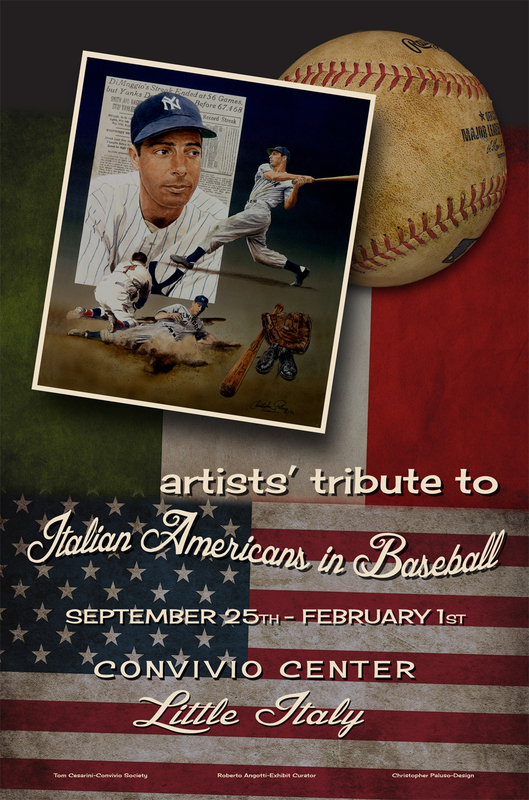 Christopher Paluso’s illustration of Joe DiMaggio is on display through February 1st at the Convivio Center. The capacity crowd was treated to a live performance by 11-year-old Italian American singing sensation, Isabella Shiff, who recently traveled to Italy to represent her country at the Zecchino d’Oro (Golden Sequin) International Festival of Children’s Song broadcast on Italian TV and won the solo vocalist competition in her age category. Internationally-acclaimed sports artist Christopher Paluso, whose legendary art has graced the walls of the Italian American Sports Museum in Chicago and the San Diego Hall of Champions, mesmerized the audience with nostalgic baseball stories centered around his personal interactions with Joe DiMaggio and other Italian American icons. Attendees read text panels detailing the Italian diaspora and assimilation into American society through baseball before viewing artwork from Christopher Paluso, James Fiorentino, Chris Felix, Vincent Scilla, John Giarizzo, Rob Monte, Zack D’Ulisse, Tom Richmond and Jeremy Nash in addition to photos from Tom DiPace, Rob Cuni and Robb Long. Ron Santo, Tommy Lasorda, Tony Conigliaro, Joe Garagiola, Craig Biggio, Tony La Russa, John D’Acquisto, John Montefusco, Ken Caminiti, Mike Piazza, Frank Catalanotto, Frank Menechino, Jason Giambi, Joey Votto, Jason Grilli, Anthony Rizzo, Nick Punto, Chris Denorfia, Drew Butera, Dan Serafini, Alex Liddi, Chris Colabello, Brian Sweeney, Mike Costanzo, and Reid Rizzo. 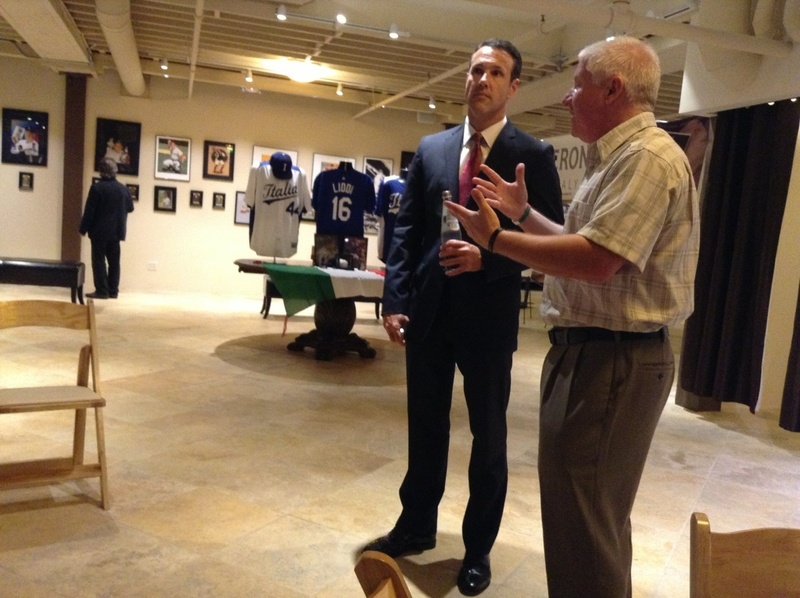 Throughout the exhibit’s exclusive engagement at Convivio, monthly birthday celebrations will feature movies and guest speakers to honor the careers of players and coaches of Italian descent including: Lou Colabello (10/10), Chris Colabello and Sal Varriale (10/24), Nick Punto (11/8), Jason Grilli (11/11), Roy Campanella (11/19), Joe DiMaggio (11/25), Mike Scioscia (11/27), Dave Righetti (11/28), Tony Lazzeri (12/6), Mauro Mazzotti (12/12), Craig Biggio (12/14), Marco Mazzieri (12/20), John D’Aquisto (12/24), Tony Conigliaro (1/7), Jason Giambi (1/8), Kurt Bevacqua (1/23) and Dan Serafini (1/25). Christopher Paluso stands next to his Joe Garagiola piece along with CBS News Anchor Carlo Cecchetto. Christopher Paluso is the official artist for the San Diego Hall of Champions Sports Museum and the National Italian American Sports Hall of Fame in Chicago. 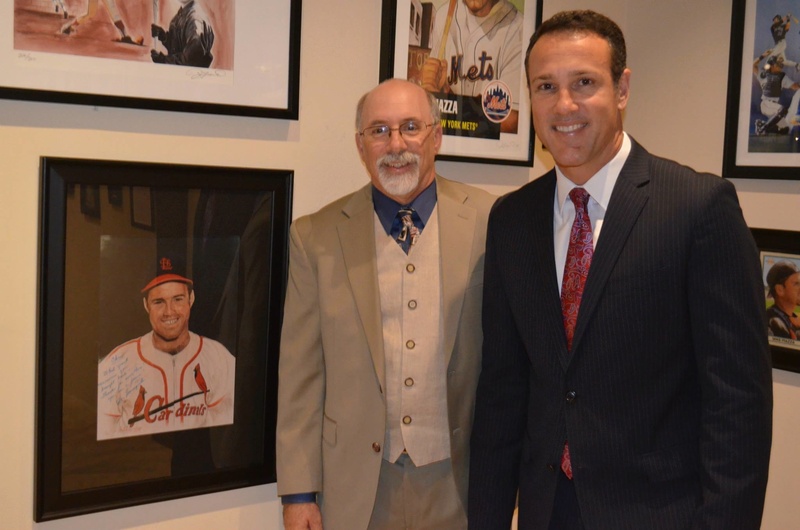 His work has included many Italian American baseball players (including DiMaggio, Berra, Lasorda and Piazza) and has appeared on magazine covers, limited edition lithographs, collector plates, baseballs and in museums. Visit http://paluso4art.blogspot.com for a glimpse of his legendary artwork. Support from Italian Ambassador to the U.S. Claudio Bisogniero, FIBS, Team Italia coach Mike Piazza and CBS News has given Artists’ Tribute to Italian Americans in Baseball a great start in San Diego. A special thank you goes out to all who have made this monumental exhibition possible and free to the public. Congrats to Italia! Under 18 European Champions! Forza Italia!